Dr. Nahla Merhi received her medical training from the American University of Beirut where she graduated with the highest distinction, and was awarded the Alpha Omega Alpha honor. She then completed her residency training in OB/GYN at Lutheran Medical Central in New York in 2002. Dr. Merhi is proud to have 2 board certifications. The first is in general Gynecology and the second in the sub-specialty of Female Pelvic Medicine and Reconstructive Surgery known as Urogynecology. In 2007, Dr. Merhi started Suburban Gynecology where she is dedicated specifically to Gynecology & Urogynecology services and surgeries. Dr. Merhi has a special interest in treating urinary incontinence and pelvic organ prolapse. She offers her patients minimally invasive (robotic) procedures and surgeries, which allow less pain and quicker recovery for her patients. Dr. Merhi has performed more than 1000 robotic surgeries, and greater than 500 single site robotic gynecological surgeries. This makes her one of the most accomplished surgeons in the nation, and the surgeon who has performed the highest number of single site robotic hysterectomies in IL. Gynecologists come from all over the country to learn from Dr. Merhi, the most advanced techniques of the robotic, da Vinci Surgery. Dr. Merhi speaks at international and domestic conferences for minimally invasive surgery (robotic). Many patients are referred to Dr. Merhi by infertility specialists when they have fibroids and endometriosis. Dr. Merhi performs robotic surgery for removal of fibroids and endometriosis, to help with their infertility treatment. Dr. Merhi spends ample quality time with her patients to review all treatment options and ensure they are well informed, comfortable and confident about the medical decisions they make. Dr. Merhi is on staff at Silver Cross Hospital & Presence St. Joseph Medical Center. In her leisure time, Dr. Merhi enjoys cooking, traveling, and spending time with her twins and husband. 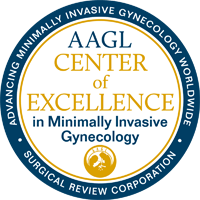 Suburban Gynecology is proud to be awarded with the Center of Excellence in Minimally Invasive Gynecology (COEMIG) Award by the AAGL, the leading association of minimally invasive gynecologic surgeries worldwide. Dr. Nahla Merhi has been the Co-Director for the COEMIG (Center of Excellence for Minimally Invasive Gynecology) at Silver Cross Hospital for more than two years and is proud to constantly work on advancing the field of Gynecologic surgery.